Here you can view and appreciate the thumbnails of 62 paintings by Lorenzo Daniele. 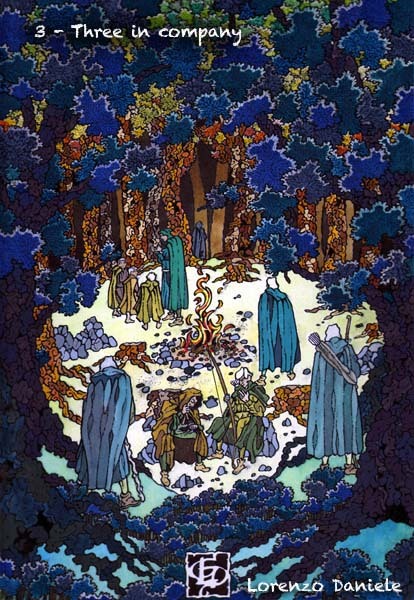 Each and every painting represents a main scene of a chapter of The Lord of the Rings by Tolkien. The chapters of the book are 62 and Lorenzo's paintings are 62! Lorenzo had to work on them for 7 years! Here you have an artwork of unique relevance, since – for what we know – there are not other similar works in the world! Tenths of translations of The Lord of the Rings are published all over the world in a lot of countries. We guys of “Endòre” offer the copyright of this Lorenzo Daniele's masterpiece to any Publishing House of whatever country in the world which would be interested in publishing an edition of The Lord of the Rings, and having EVERY chapter of the novel properly illustrated with a topical picture of the chapter itself.